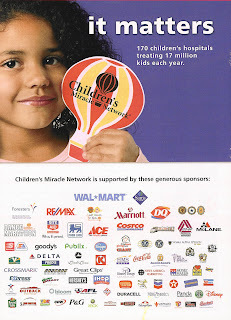 In honor of its 25th anniversary, Children’s Miracle Network (CMN) published a special 10-page insert in the June 9, 2008 issue of U.S. News & World Report, and on the last page was the sponsor recognition ad on the left. The insert was placed in U.S. News’ annual rankings of children’s hospitals in the United States. For those of you keeping score at home, there’s more than 70 current sponsors in that logo soup, several of which have been with CMN for nearly the full 25 years; notably Dairy Queen and Marriott. The logos are arranged roughly in order of current contributions. Since 1983 CMN has generated more than $3.4 billion, or on average, about $136 million a year. While CMN has a successful direct mail effort, it’s less than 10 years old. And the cause does little if any major gifts fundraising or planned giving. Therefore, it’s safe to say that all but a very small percentage of that $3.4 billion total was generated through cause-related marketing, grassroots fundraising, or some variation thereof. The reason that’s so is because of the interesting dynamic that exists between CMN and the 170 hospitals affiliated with Children’s Miracle Network. It goes almost without saying that in 1983 the hospitals did all the traditional kinds of fundraising available to them. So at CMN’s founding it couldn’t bring much value to the relationship if all it tried to do was compete for the same dollars with the hospitals it hoped to help. Consequently CMN... which started out as a telethon charity... stumbled upon the jessant form of fundraising called cause-related marketing and found its niche. CMN was like Hernando Cortez who, according to legend, upon arriving in Mexico burned his boats so as to motivate his men. (The truth about Hernando Cortez and his ships is more complicated). Once it started down the path of doing all cause-related marketing all the time, CMN had no way to grow other than to innovate. And they’ve done so reliably for a generation now. For instance, the two sponsors at the top of the heap of logos… Wal-Mart and Sam’s Club… do virtually no transactional cause-related marketing and yet together they raise more than $30 million a year for CMN’s hospitals. As a result, while there are larger charities than CMN doing cause-related marketing, I don’t believe there’s another one that has raised more money via cause-related marketing only. All this from a little charity not in New York or Los Angeles (or for that matter London or Tokyo) but in tiny Salt Lake City, Utah, founded and staffed largely by people from a state best known for its abundant natural beauty. For cause marketers the story of Children’s Miracle Network is the story of David and Goliath. It’s the story of the little engine that could. It’s the story of the dragon-killer who was only a child. It’s almost Homeric. The story of CMN’s success should have the same effect on other charity cause marketers that the story Roger Banister’s breaking the 4-minute mile has on middle distance runners. Ten years after Sir Roger ran a sub 4-minute mile in 1954 on the Iffley Road Track at Oxford University, a high school kid from Kansas named Jim Ryan ran the mile in 3:59. So have 40-year-olds. Some runners have bested it hundreds of times. Fifty-four years after Bannister broke the psychological barrier of the 4-minute mile, it is the standard for professional middle distance male runners. Children's Miracle Network raising $3.4 billion in 25 years is the story charity cause marketers should tell themselves when they're feeling down because they can’t seem to get an appointment with a potential sponsor. Because if, in the early days, someone from Utah could get in to see a potential sponsor to talk about a kind of sponsorship and a charity that no one had ever heard of, you can probably figure out a way in, too.